During the study tour of nine European cities organised by the Netherlands Foundation for Visual Arts, Design and Architecture, we saw how in times of change authorities deploy culture to promote their city. Whats more, we met with activists who try to improve urban living conditions, for themselves and fellow citizens. In Skopje (Macedonia), for instance, we made the acquaintance of the First Archi Brigade (Prva Arhi Brigada), a small group of architecture students who highlight the recent building history of the city and campaign against any extreme interventions in the urban tissue. Emotions sometimes run high and even provoke violent reactions. In Prishtina (Kosovo) we were received by Petrit Selimi in his cafe and shop for comics. Still in his early thirties, he has already amassed an impressive CV, sits on the board of the George Soros Foundation in Kosovo, and seems destined for a career in politics. At breakneck speed he told an optimistic story about what he sees are opportunities to build up a new and especially open society in Kosovo. One thing we quickly agreed on: building and marrying are what Kosovars like to do most of all. New houses are everywhere, huddled tightly together in the centre of Prishtina, or standing forlorn on former farmland on the edge of the city. And besides traders in building materials, there are lots of shops selling wedding dresses. Kosovo has been undergoing an unprecedented building boom ever since 1999 when NATO intervened in the struggle between Serbian troops and the Kosovo Liberation Army (KLA). Building seems to be a way of saying: this land is ours. At the same time, the return of Kosovars who had fled and rural-urban migration has significantly increased the demand for homes. A large number of them have been built illegally. In fact, up to 2005 it was impossible even to apply for a building permit because the city authorities had no legally binding planning policy. The wedding dresses point to another phenomenon: family is sacred in the Balkans. 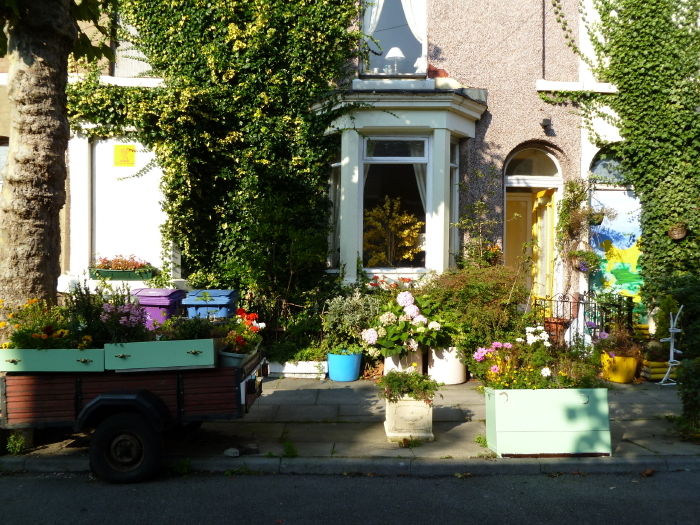 Communities  certainly if theyve just moved from the countryside to the city  are often still organised around families. We encountered a similar emphasis on family ties in Tirana, where Darina Kokona of Co-PLAN, the Institute for Habitat Development, guided us around one of the neighbourhoods that was built illegally during the anarchistic 1990s. Co-PLAN worked to improve community amenities such as good access roads, refuse collection and a school. This occurred in close collaboration with representatives of the community, who were often the heads of clans. This non-profit organisation is trying to channel bottom-up developments by strengthening and connecting them with top-down strategies. As a consequence of a very abrupt and violent transition from a society built on collectivism to an extremely liberal form of capitalism, the law of the jungle often applies in Balkan cities. Everybody has to look after themselves, and homes have turned from a human right into an investment, with all that that entails. Since there is no alternative to the illegal structures and since there are so many of them, the authorities often decide to accept the new neighbourhoods as a fait accompli. Attempts are gradually being made to get a grip on society, however. Property tax is applied now for example to enable investment in public amenities. That will make the city cleaner and safer and improves the quality of life. After the chaos of recent decades, the residents of Prishtina and Tirana are ready for a bit of top-down organisation. In Marseilles the authorities seem oblivious to the miserable conditions in the poorest districts of the city, as though they have long abandoned them. When built, the modernist ensembles of Parc Kallisté and Campagne Lévêque in the north of the city were the pinnacle of modern living for the lower-middle social classes. Now they are vertical slums populated by immigrants from Algeria, Africa and Eastern Europe. The problems are particularly severe in Parc Kallisté. The flats in the blocks are owned by various slumlords, and that means they are poorly maintained and the public areas are a squalid no-mans-land. Residents come from everywhere and have difficulty organising themselves. On top of that, many people view life in the housing complexes as a temporary refuge on the way to a better existence  not worth investing time or energy in. Our host Didier Bonnet is an exception. Bonnet is not a resident, however, but more of a socially conscious entrepreneur, as he likes to call himself. 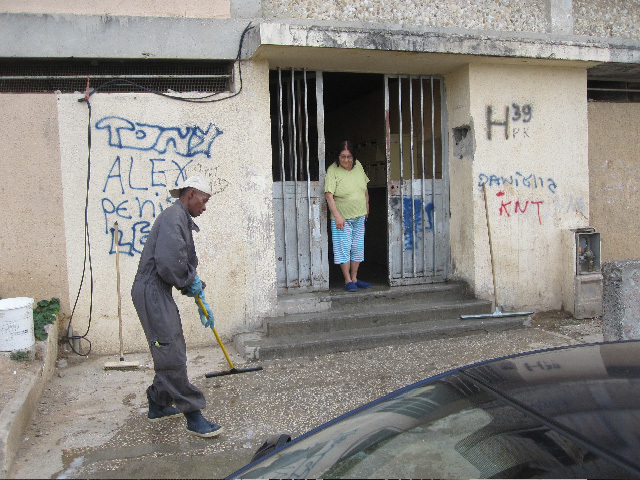 ADRETS, his business, has provided a sports field and arranged a small salary for a number of residents to clean the shared spaces. As long as residents cannot organise themselves in large groups and the government refuses to tackle such districts, his efforts would seem to be just a drop in the ocean, even if the cleaners beam proudly from all the attention from the Dutch visitors. Our guide in Campagne Lévêque was Christine Breton, who said farewell to the traditional art world where she worked as a curator so that she could invest her unstoppable energy in projects like the Hôtel du Nord, which provides bed and breakfast at the homes of residents in poor neighbourhoods. She took us up an illegal route called an ‘ascenseur’ (lift), a short-cut for young people through a hole in a fence, and told us about the majestic stairs that were once here. Through her activities she is attempting to connect the history of the place to the lives of residents in order to infuse the tabula rasa of modernism and the rupture of immigration with new narratives. On the other side of the Channel, the population in some neighbourhoods of Liverpool has dropped by as much as two-thirds since the modernisation of port activities and the disappearance of major sources of employment such as the mining and textile industries. We were heartily welcomed by the last remaining residents of the small streets around Cairns Street in the Bloom district. In the 1980s this was the scene of riots as a result of high unemployment and ethnic tensions. Its been downhill ever since for the neighbourhood as residents gradually moved elsewhere. Just a couple of elderly ladies still reside among the boarded-up buildings. They refuse to leave because they have often lived here all their lives and cannot afford to find suitable alternative accommodation elsewhere. To keep up their spirits they have given the boarded-up buildings across the road a fresh coat of paint and planted flowers in the gardens. The bubbling energy we encountered in Skopje, Prishtina and Tirana contrasts starkly with the stagnation in Marseilles and the shrinkage in northern England. While a lack of central regulation is clearly evident in the Balkans, cities in western Europe seem offer little scope for individual initiative precisely because of an excess of regulations. Yet there, too, we came across highly motivated people who were investing time and effort to improve the city for the most vulnerable people at the bottom. 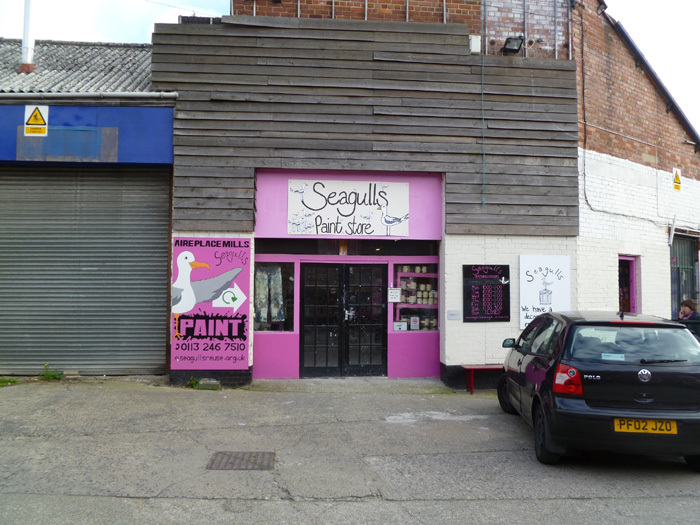 Two of them are Kate and Cat, the founders of Seagulls in Leeds. This small firm collects paint leftovers, mixes them together, and sells them again for a modest price. Seagulls is working for a more sustainable existence, and the firm offers work to young people with a problem or a handicap. Whats more, people without too much money can contract Seagulls to carry out a painting job for a modest sum of money. Not that Kate and Cat have solved the problems of the lower classes  or of themselves, because they just about keep their heads above water  but Seagulls does constitute a cheerful note in what is a rather spruced-up and fenced-off English city. Click here for the documentary Les Nettoyeurs by Jean-Michel Papazia about the project by Didier Bonnet.